Representational State Transfer (REST) is lightweight, HTTP based and runs on web servers much like ‘normal’ web sites. Instead of delivering in HTML, which is a combination of presentation and data, data is displayed with minimum formatting using separators and delimiters (like JSON). It can be thought of as an architectural style for designing networked applications or as a way of delivering web services. REST is browsable, so helps developers modify and check the correctness of their code as only the data is displayed in the browser. It is a safer method of providing services or data access as it does not expose much unnecessary surface area of the database used by the website. Some well-known REST apis are from Twitter and Facebook Graph. REST is platform and language independent. You could write a REST API with any languages that are typically associated with website creation such as PHP, Python or Ruby. There are four commonly defined methods used in REST architecture. These are the create, read, update and delete (CRUD) methods. It is also possible to add more specialized methods such as retrieving the top ten most popular items or the highscore of all users. This could be achieved by writing a new method or using a query parameter such as /api/items?top=10. You might remember from creating web forms (synchronous) or ajax request (asynchronous) calls that you used GET and POST requests. The PUT and DELETE requests are less used. If you then wrote an application in PHP, Python or other language to process form data, you have written your own simple REST framework. POST, GET, PUT and DELETE correspond to create, read, update and delete and relate to basic database operations. API endpoints describe available operations on data exposed by the service. Think of them as urls that provide data (GET request) or an url where you can submit data to (POST request). Many data formats could be used but the more common are JSON and XML. GET /api/boats/123456 will return data on the boat with an id of 123456 even when applied multiple times. We will be using Django (Python MVC framework) and djangorestframework. Djangorestframework is built using django (python) specifically for exposing data via the REST framework. To begin, you will need to have Python v2.7 or later and Django 1.7.4 or later installed. If you do not, install Python and Django now. This is the list of files and folders created. If you open the URL http://127.0.0.1:8000/ you will see a placeholder website. Now we have a bare skeleton of the site. Next we will build an app (a container) which houses a model (as in Model-View-Controller). A model is the source of data for your app. Inside the models.py file, there is the import line from django.db import models. Add the following code to it. This creates a class that exposes the name, created date of the fish and if the data row is active or not. You can change the field type by referring to the relevant documentation. Now add the fishes app to the marine/settings.py file to register it. Do this by under INSTALLED_APPS, adding fishes to the list. Run python manage.py sql fishes to see a preview of the database schema SQL that will run when we activate the app. To confirm creating the relevant tables in the default sqlite database, type python manage.py migrate or python manage.py syncdb on older Django versions. Django will create authentication tables by default and the empty fishes_fish table in a sqlite3 database. The prompt will ask if you want to create a superuser as this is the first time you have run Django. Open 127.0.0.1:8000/admin and enter the superuser id and password. You should see a admin page with the Marine list. Click on Fishes to add or modify data. Add some data. This code switches on API routing which is crucial to the `djangorestframework and uses regular expression to set the valid URLs of the site. Now if you open http://127.0.0.1:8000/api/fishes/ you will see the browsable API. You can find the source code for the REST API app on GitHub. There is no data so you will need to run python manage.py migrate or python manage.py syncdb on older Django versions after downloading. Not using Core Data for now. Select a location to save your project and click Create. We will work on the files contained the Fishes folder. By default, the project has a View Controller. We want to show the data from the REST API as a list, so will use a Table View Controller instead. Create a new set of Objective-C files (File > New > File > iOS Source > Cocoa Touch Class). Save these new files in the Fishes folder. 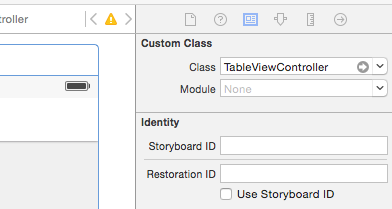 Open Main.storyboard, go to the Object library and drag the Table View Controller object to the storyboard. Select and delete the default View Controller. Make sure that in the Inspector, the checkbox for Is Initial View Controller for the selected Table View Controller is ticked. 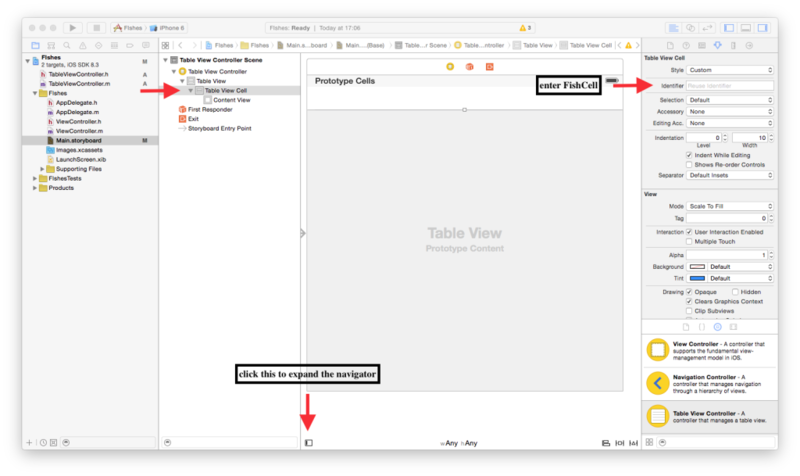 – In Main.storyboard, expand the Table View Controller to expose Table View Cell, select the Attributes Inspector and enter FishCell as the Identifier. This links the cells in the Interface Builder storyboard to the code. – Change the Style to Subtitle from Basic. This allows us to display the value set by cell.detailTextLabel. – Select Table View Controller under the Table View Controller Scene, click on the Identity Inspector and enter TableViewController into Custom Class > Class. This links the entire scene to the TableViewController.m file. Next, we add code that will make this app do something. The code demonstrates the use of a simple NSArray to display data hardcoded in the TableViewController.m. Replace any existing functions with the below. #warning Potentially incomplete method implementation. Now, we can test this simple application. Select Product > Run. Next we need to obtain JSON from the REST api we published using the djangorestframework. We established a NSArray object called fishJson by registering it at the@interfacelevel and synthesizing it with@propertyand@synthesize. This replaces the code for the setters and getters. We then replace the code we had in thenumberOfRowsInSection, where we replace fishes with fishJson that contains the JSON from the REST API. Again replace any existing functions or declarations. Here we update the numberOfRowsInSection method. This code ensures that the number of rows matches the number of elements contained in the fishJson array. Now we have a working simple mobile app to display data obtained from an online or local REST API. You can find the code for the iOS app in the same repository above. This tutorial contained a lot of concepts and components which is typical of ‘real world’ apps. If you experienced any issues or have any questions or comments, please let me know in the comments below. How you can differentiate which client makes the request? I.e. for js, you'll have to validate captcha or for mobile you'll have to send some push notifications and so on. Do you think http headers are a good approach?